Donald Glover is a serious artist now. His television series Atlanta established him as a dramatic actor and filmmaking auteur, while his 2016 Childish Gambino album Awaken, My Love! made him a left-field pop star, melding rap, soul, funk, and his own magnetic presence into something more sophisticated and critically palatable than his jokey early music. Most importantly—to his reputation, anyway—Glover’s 2018 single and video “This Is America” solidified him as the sort of figure who can speak (however clumsily) on the gravest issues facing our country, and expect the country to listen. Guava Island, a new film project that premiered on the same weekend that Glover headlined Coachella, came with a level of anticipation informed by these accomplishments. Alas, it visibly strains to meet expectations. What could have been a lighthearted visual album, providing stylish accompaniment to a new set of Gambino tunes, instead attempts ambitiously to be something like a full-on movie musical. Guava Island’s song-oriented sequences can be delightful, but its narrative feels flimsy and tacked on, its acting is mostly dull (with a remarkably bad Caribbean accent from Glover himself), and its political allegory barely rises to the level of a Disney cartoon. Written by Gambino’s brother Stephen Glover and directed by his frequent collaborator Hiro Murai, Guava Island is spiritually akin to Prince’s Purple Rain film, in that it mostly functions as a star vehicle for Gambino itself, and its plot centers on the purity and power of music in a world full of suffering. Your potential for enjoyment ultimately comes down to your feelings about Gambino. Purple Rain isn’t the best story either, but if you love Prince, it doesn’t really matter. Whether Glover has a similar power to elevate his surroundings is an open question. Glover pays Deni Maroon, a Bob Marley-esque musician, in a relationship with his childhood love Kofi Novia, played by Rihanna. They live on the fictional island paradise of the title, which produces a particular blue fabric and garments that are coveted all over the world. A despot named Red Cargo owns the factories that make the fabric and clothes, which employ both Deni and Novia, and insists on his workers toiling around the clock. To bring Guava Island’s exhausted people together, Deni decides to throw a music festival, an all-night affair that might drive workers to take the next day off, which the profit-obsessed Red cannot abide. Red gives Deni a proposition: take a payoff and cancel the concert, or go on performing with the knowledge that his life may be in danger. The questions that Guava Island raises, about the deleterious effects of capitalism and commerce on art, the environment, and the human spirit, are as worthwhile to ponder now as ever. But in positioning music and dancing as a cure-all counterbalance to these forces, the film offers an overly neat and simplistic answer. Guava Island fares better during its song sequences, when it allows the music to be music, and not a hollow stand-in for the forces of good in the world. The elaborate dance routine that blooms upon the appearance of “This Is America” is electrifying, and a good corrective to its self-righteous music video. 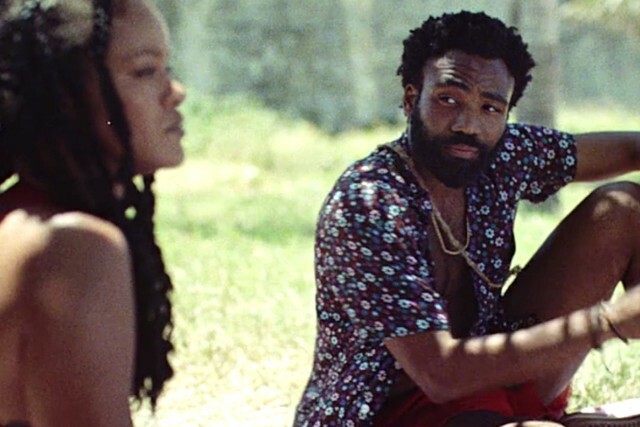 When Deni woos Kofi on the beach to Gambino’s genuinely great “Summertime Magic,” it’s the most charming moment for an otherwise uninteresting character. The island-tinged music occasionally feels inauthentic, in much the same way that Awaken, My Love! bordered on P-Funk cosplay. But Glover is an undeniably captivating performer, with nimble feet and an almost absurdly expressive face. His charismatic presence is almost enough to elevate the weaker material. When he performs, Guava Island comes alive. Deni puts music and community above all else, especially money. But as Guava Island hurtles to an ending that’s plainly reminiscent of the real-life 1976 assassination attempt on Bob Marley, the film begins to feel less like an altruistic tribute to the power of song than a narcissistic celebration of Childish Gambino’s songs in particular. Guava Island has a few things going for it—the songs themselves, the picturesque setting, the chance to watch Childish Gambino and Rihanna looking beautiful together onscreen for an hour—but its insistence on its unimaginative message, and messianic treatment of its main character, undermines these appeals. Compare Guava Island to Lemonade, Beyoncé’s blockbuster visual album. The latter told no linear story, but still conveyed complex ideas about about identity, gender, race, and love, through the power of its meticulous and multivalent imagery, and of the music itself. Guava Island comes with an involved story to help hammer its themes home, but still can’t communicate them as effectively. It fails to bear the weight of its big ideas, or to convince you that they’re more interesting than simply watching Gambino and Rihanna dancing together. Guava Island insists that music is the most important and powerful thing in the world, but in its reliance on so much unnecessary nonmusical baggage, it doesn’t seem to believe its own message.